15 Tips for Your First SOLO Camping Trip! Why the heck would I want to camp alone, somewhere in the wild? I feel proud when my tent is up, I cherish the moments I am nestled in my sleeping bag and read by the light of my headlamp. I love the instant I open the zippers in the morning and smell the fresh dew-filled air. Wild camping brings me a sense of accomplishment, adventure and strengthens my self-confidence. I hope I can inspire you to make the big step in your hiking career and go camping by yourself. It would be quite understandable if you had some anxiety around the issue. What to bring? What kind of shelter should I buy or borrow? How to make a camp? Will I die? Don’t worry! I will try to ease the anxiety with some helpful tips. First of all – choosing the right (for you!) shelter. You are to buy a backpacking tent which means that its weight is absolutely crucial – you will carry it all the way! And if you hike alone – there is no one to share the burden. But don’t jump right away to the lightest option possible. There are a lot of ultra-light enthusiasts out there who love the idea of minimalist shelter: a tarp, a bivvy or a hammock. You have to ask yourself if that is really for you. I know it is not for me. I, for example, want to have the illusion of a safe shelter. It might not be real walls, but the fabric is a pretty good protection from the elements as well as the various creepy crawly beasties out there. I also prefer to have all my gear inside with me. No need to worry that sudden heavy rain during a night completely soaked my backpack or such. Even if I hiked in a desert – I would at least need a full net tent (with no flysheet). But you might have a complete different set of requirements and factors to consider. To learn more about your various options in shelters, read this article. My beginner camping suggestion: For the first-time camper, I would suggest going easy on the minimalist extreme. Get yourself a small (1-2 person) tent that is under or around 2kg. If you can afford it – try something around 1 – 1,5kg. I am pretty happy with my Vango for a budget option. I hope to update it to something lighter, but its 2kg is pretty decent. If you would like to see what’s out there for solo hikers, look below! 2. Check your tent before you hit the trail! This is very important – pitch your new tent before you head off hiking. Check if you know how it works and if there isn’t anything missing. See if you can attach the inner tent to the flysheet – it’s useful when you have to pitch it in a rain. If you borrowed your shelter, check if all is working properly, if there is no mold, holes or broken pieces. If you want you may change the (probably) flimsy pegs into something light and durable. I got myself a set of MSR Groundhog Tent Stake Kit and combine it with the original tent’s pegs. The next big thing is a good sleeping bag. That, of course, depends on the season, weather and your own needs. Please remember, that women need much warmer sleeping bags! Also get a sleeping bag with a safe margin of comfort temperature. If you know the temperature might drop to 8°C, don’t bring a sleeping bag with “8°C comfort for women” but take one with 0°- 5°C. Remember that those indicators are just suggestions – when we are tired, when it’s damp out there we feel the ambient temperature quite differently. When I hiked in Scotland last year I had a synthetic sleeping bag which was supposed to be a 5°C comfort for women. I was cold so many times! And I’m pretty sure the temps did not fall below 5°C! But I was exhausted, it was often damp and windy. All of it influences the way we feel. This should keep me warm/comfortable (in theory) at least to -10°C. I hiked with it in Catalonia in February (and in Iceland in August) and I felt great. One day the temperature dropped around 0°C, but most of the time it was above 5°C. Only once I felt too warm, I am really happy I got the 800g version, as I was shocked how much condensation there was on the sleeping bag each morning! If you want to learn more about down sleeping bags you can read this helpful guide. 4. The first decision you have to make is: synthetic or down. Synthetic – heavier but superior in wet conditions. Good for summer with rain falls. Down – superior in terms of warmth and weight. But you have to be very careful about it staying dry – including your own sweat and condensation! It’s good to air-dry it every morning during a long hike. TIP! Please remember – you cannot store your sleeping bag in the compression bag! When you return back home – store it in a big bag or (if you have the room) hang it. Grab for yourself the lightest air/inflatable you can afford but pay attention to the RV factor: the higher the better insulation. The low ones are good only for warm summer camping or camping in shelters. (EDIT: I did! I love it! You can read my in-depth review of the Therm-a-Rest NeoAir Xlite for women here.). I like to have some basic comfort after a long day of hiking! But if you like sleeping on hard surfaces you might want to consider it. Just make sure you clear the spot for your tent really well! Warm food is a must. You don’t need it on a day hike, but if you plan on camping – your body needs something warm in its belly. Also – there is something magical about the morning coffee enjoyed right in front of your tent. There is no need to grab half a kitchen with you – one pot is completely enough! I have a one pot cooking system - either using my old MSR PocketRocket stove with aluminum pot or the new Jetboil MiniMo integrated stove. I generally use about 600-750 ml of water – about 300 for coffee/tea and the rest for soup or oatmeal. No need for plates or such (unless you cook for more than one person). I know there are people who take tiny containers of spices and such, but I don’t care for that. If you feel you need a tasty meal after the day of hiking to feel good – grab a few more items, but be reasonable! TIP! If you are flying to your hiking & camping destination you cannot take your gas canister with you! You have to buy it at the location. Make sure to check if it's available there and if it's the right kind (some use a twist-on or push-in type). Headlamp – an absolute must. Take also a set of spare batteries. You might want to take a separate lantern to use in the tent, but it is not necessary. Kindle – that one is not a must, but a very useful piece of gear. Not only to have all your books in one place but also you can download to it all necessary documents – pdf with your flight details, insurance, trail description, local bus timetables… etc. Sweets – not just as snacks, but it’s nice to have a favorite treat with you. It might be a hot cocoa or instant pudding, but it will make your camping a night to remember. Making Your Camp, or: How to Pitch Your Tent in the Wild for the Best Possible Experience! 8. Making Your (Wild) Camp: Research the Camping Rights! Make sure you research ahead of time what are the laws in the country you plan on hiking. In some places it’s accepted or even legally protected to wild camp, in others it’s prohibited, yet in others, it’s not exactly allowed but accepted if you don’t make problems. Check this to be prepared! If you plan on hiking along the West Highland Way, the Great Glen or the Skye Trail in Scotland check my resource page for info on campsites and wild camping spots. Learn how to find the best campsite in this article and get some tips on camping in the rain over here. 9. Making Your (Wild) Camp: Research the Terrain. Is it even possible to camp there? If you plan on hiking in boggy and muddy areas, finding somewhat dry and flat surface to pitch your tent might be close to impossible. Even worse, if you hike in a very rugged, mountainous area – what if there are no flat spots at all? Check it well ahead of time! It might be that you have to choose a different tent – one that is free-standing might be a better idea for a very rocky terrain with no soft soil to ground the pegs. On some trails, the only option is staying at designated campsites or shelters, forcing you to walk much farther than you want. Generally when wild camping we try to hide a bit. 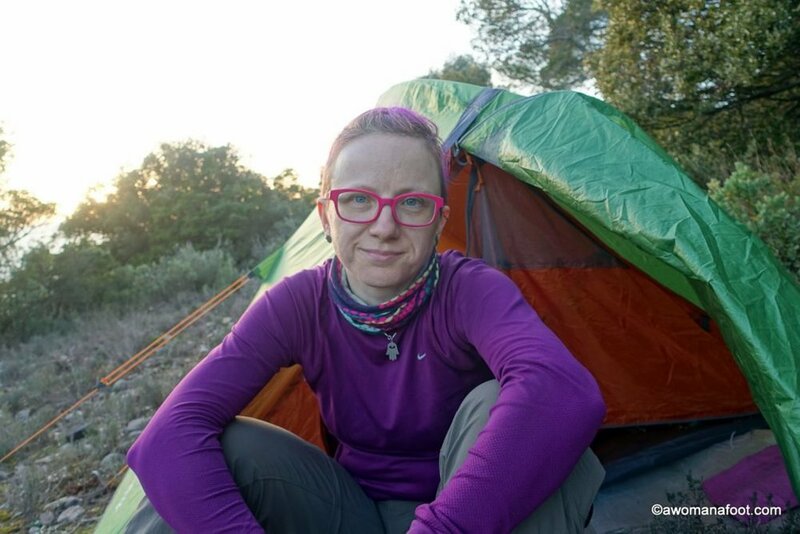 Don’t pitch your tent in the middle of a trail, you know? If only possible – go away a bit. We also need water, right? So it’s a good idea to camp not far from a natural water source, just be careful if it’s raining – you don’t want to wake up in the water source. If there are no streams or lakes make sure you bring enough water with you. Find a flat surface and clear it from stones, branches and such. Try and find a spot that makes the least damage to the natural flora. Make sure there are no branches hanging over the place – in case there are strong winds later on. Pay attention to the wind – it’s good to have a nice breeze (scares midges away) but don’t make your tent into a sail, or a balloon. Don't get scared if there is some wind in the forecast. Read this handy guide to pitching a tent in high winds and you are all good to go! If there is no perfectly flat spot - always sleep with your head higher than legs. Once I fell asleep on a spot just tiny bit uneven - so I didn't even realize it at first. I woke up a few hours later with massive vertigo. It all disappeared when switched my sleeping position. Don’t make your camp in the lowest place in a ravine - not only that cold air gathers in such low points, but if there is rain you can wake up in a pool of water. 11. Find the Right Spot for When You Need "To Go"
Go and find a good place for a “bathroom” – you will use it either the same evening or in the morning, better prepare. Make a hole about 20 cm deep, well away from any water source. Mark it somehow or remember something unique about this place (a tree/bush) so you find it easily when you need it. Make sure to dispose the feces inside and cover it well with soil, so no animals would get to it. Leave no trace is a very important set of rules – learn and follow them! Pack any kind of garbage with you – leave no trace! Be prepared and take plastic bags to pack with you all your garbage - including organic leftovers or fruit peels. Most of the time it's enough to just rinse your dirty dishes with water - but don't just dump the gray (dirty) water back to a stream or lake! Pour it away dispersing it widely. You may want to use sand or soil to help with cleaning. Using biodegradable soap does not mean it is safe to be introduced to water sources! You don't have to take a shower every night. I will tell you a secret: Last year when I went camping and could not clean myself daily as I was used to, my skin got better. I stopped using BB-creams, just simple face cream for allergy-prone folks and delicate Cetaphil cleaner which I used only when staying at a regular campsite with bathrooms. Which meant that sometimes I didn't clean my face for two or three days... and it got better. I have learned from it: although I do clean my face twice a day, I stopped using any cosmetics other than the Cetaphil cleanser and simple face moisturizer for Atopic skin. My skin is quite grateful for it. Having your period should not stop you from having fun in the wild. It just requires being prepared and a few extra things to take. I use a menstruation cup and highly recommend it for hiking. I also grab special feminine hygiene tissues (don't throw them away - pack and dispose of them back home) to clean myself after replacing the cup. Some women prefer tampons - whatever you feel comfortable with. Just remember not to throw away your used tampons - pack them and take with you to dispose of properly. The general rule is to get going in the morning as soon as possible. I must admit it’s hard for me – I’m really slow in the morning! It is especially important in a country where wild camping is only semi-accepted. Pack the tent first, then make breakfast, eat and finish packing. You can also start hiking without breakfast and stop after a while in a nice spot for breakfast and coffee. How was your solo camping adventure? Would you add anything to the tips? Let me know below! Between Goat Eyes and Fresh Strawberries: Why Visiting La Boqueria Market in Barcelona is a MUST!